It was five years ago this month (July 2011) that I began preparing for my second New York Comic Con appearance. I had decided beforehand to dedicate the entire summer to getting new work ready. This included new prints, my first (and, to date, only) sketchbook (for sale, that is) and a collapsible banner to draw people to my table. Amongst the pieces I created that summer were an unused cover idea I had wanted to submit to Planet Lovecraft Magazine (before it closed its doors) of Cthulhu sitting in an armchair in Victorian attire, reading a copy of the magazine and an acrylic painting of a nameless Indian female warrior. It’s a little hard to believe that that particular summer, though I had no idea at the time, ultimately became a defining period for me, as the aforementioned two pieces would become the subjects of most of what I would do for the next five years (and beyond, as I have planned). 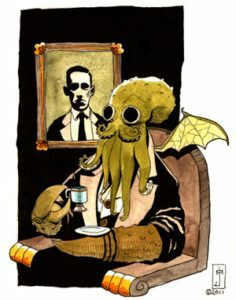 Though Cthulhu Taking Tea didn’t evolve into Gentleman Cthulhu (gentlemancthulhu.com) for many years, it did end up on the cover of another Lovecraftian Magazine: Innsmouth Magazine: Collected Issues 5 – 7 (barnesandnoble.com/w/innsmouth-magazine-silvia-moreno-garcia/1114620532). Today’s Gentleman Cthulhu comic (The Original) is in dedication (as it were) to the creation of the piece which grew into this bizarre and fun idea. Strangely enough, I wrote the script for it in August of last year. It was the 45th Gentleman Cthulhu script I wrote (I number them, to help keep track), though I did not plan for it to be #45 on the site (even though it’s actually the 49th posted comic). An interesting coincidence, but I digress. 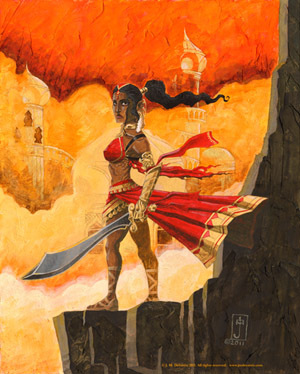 As for Goddess of Sand, her evolution into Chadhiyana was much quicker (though not without intense effort and time). As I’ve told the story many times, I placed this painting at the top of my banner at NYCC 2011 and enough people asked about her and her story that I ultimately abandoned all the other projects I had planned (a graphic novel and two children’s books) and concentrated on exploring this character and her story. 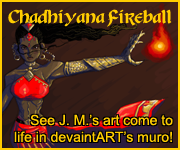 As Tolkien said and as George R. R. Martin has quoted him, “[The] tale grew in the telling.” Creating Chadhiyana was like lighting a fire in a forest of dead trees. It quickly lit and spread, and before I knew it I had more material than I’d created for any single project in my entire life before that (perhaps even all of them added up together; that isn’t quite true–yet, at least) and I was then only about six months or a year into her creation. Though so very little of her story (by comparison) has been published at this point. I find it strange, too, how different these two creations of mine are. Gentleman Cthulhu is weird and light-hearted (funny, I’d say, though that’s up to the reader, really), whilst Chadhiyana is dark and serious. Gentleman Cthulhu is a little more “traditional” in what one might expect from a comic, whereas Chadhiyana is (in my estimation) revolutionary. Similarly, Gentleman Cthulhu is, for me, something which years ago I would more traditionally create, while Chadhiyana is so starkly different from what is being done or what I’ve done in the past. Whereas Gentleman Cthulhu is derivative (both of my love of the work of H. P. Lovecraft and Mike Mignola, largely), Chadhiyana is its own thing, born indeed from inspiration, but those being so varied. And, of course, Gentleman Cthulhu has that proper and pompous gentlemanly tone (albeit tongue-in-cheek), whilst Chadhiyana is more emotional and physical. And yet, as different as the two are, they are both, in their own way, a reflection of myself. Little wonder it is then that every time I think I’ve come up with the last possible idea I can for these two characters (individually, that is), a slew of others spring up. I begin to worry more that I’ll have the time and energy to finish it all (but I’m still young–so I have confidence I’ll be able to; if only I could draw as fast as I write, but that’s always the trouble with comics). I was once told by someone who looked for artistic talent (not an agent–she worked for an artist directory), upon looking at my work, that “You’re not a one trick pony”. Perhaps in working on these two very different works simultaneously there is some proof for her statement. I think (in part) its why in the past I had such trouble beginning projects because I have so many different ideas, I would never know where to start. But, in truth, Chadhiyana was the first one that grabbed me so tightly I couldn’t ignore it (indeed, I feel a real need to tell her story, as I’ve said in the past), and Gentleman Cthulhu…well, he just keeps me sane and smiling while I juggle everything else in my life (Chadhiyana included). It’s been quite a journey so far (though I’ve been on it for much longer than anyone who’s been reading this stuff), and I wonder what the next five years of Chadhiyana and Gentleman Cthulhu will bring. 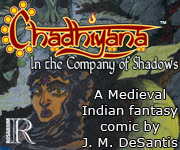 To date, there are three published Chadhiyana stories (one in-progress; four if you count the one-page Chadhiyana: Vampyre Hunter) and that’s only a drop in the bucket of my plan for her (the series does have an ending, however, if I haven’t stated it before). As of this writing, I’ve also written a little over a hundred Gentleman Cthulhu scripts with some ten or so notes for more ideas (not to mention the ones floating in my head). It’s safe to say that, as long as I can keep drawing them, these two should be occupying my time for a bit (to say the least). Though I wouldn’t have it any other way. I hope you all continue to enjoy them and whatever else crawls out of me over the years. Creating (writing and arting) is truly one of my favourite things to do. Here’s to many more years of it and to Cthulhu Taking Tea and Goddess of Sand for giving me something I enjoy to focus on.